By Angela Doland . Published on August 18, 2016. The mask emits a farting odor to accompany a South Park video game. For months, Paris-based agency Buzzman has spent a lot of time thinking about flatulence. The team was looking for "the smell of the perfect fart, the universal fart," says Buzzman's president and executive creative director, Georges Mohammed-Chérif. It created 20 to 25 sample odors designed to mimic the smell of someone passing gas. It even tapped perfumers – referred to in French as "noses" – to concoct it. 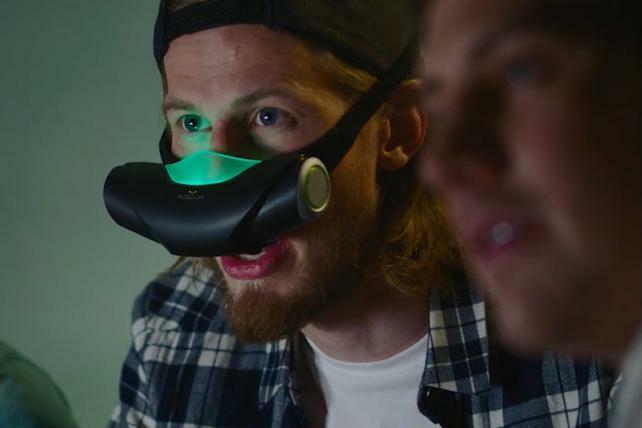 This all culminated in an unusual product: a virtual reality mask to infuse the nasal passages with odor. The mask has many potential future uses, but the first is for video game maker Ubisoft, which is using it to promote a South Park game that involves a character who farts a lot. But let's back up. How did this idea get off the ground? About a year ago, the independent ad agency launched a new department for creating products. It has had success with that in the past; for Mondelez brand Milka, for example, it dreamed up chocolate bars with one square missing, giving people the option of sending the piece to a friend. Ten-year-old Buzzman, whose clients also include Burger King, Ikea and Chinese tech company Huawei, was Ad Age's International Small Agency of the Year in 2011. The division, called Productman, was freshly formed when Buzzman had a meeting with Ubisoft, the creator of "Assassin's Creed," "Far Cry" and other games. The company was creating a South Park video game, which featured existing characters but also a new one, a kid whose flatulence gives him superpowers. Passing gas can teletransport him elsewhere. The game is called "South Park: The Fractured But Whole," which makes more sense when you say it out loud. Agency creatives "got it into their head to do something about farts," said Mr. Mohammed-Chérif, even though "in advertising, it's usually not recommended to do anything involving farting." The mask delivers puffs of odor when it detects an ultrasound signal coming from the game. The scent goes away quickly, and doesn't bother others. To put the project together, the team tapped chemists, software engineers, industrial designers and professional "noses" more accustomed to creating perfumes. "I sniffed more than 1,000 farts before mixing the right odor," Isabelle Ferrand, a nose, says in a promotional video. Her team tried out odors including onion, cabbage and chorizo to come up with the formula, which it dubbed "Fart No. 3." Ubisoft says it has no plans to sell the mask to consumers. But it's using it at promotional events, including at Gamescom, a video game trade fair being held in Cologne, Germany, before the game's official release in December. How do people react when they try the mask? People are mostly surprised it's for real. "They say, 'It's crazy that you actually made it, it's not just a communications gag,'" said Francois-Xavier Denièle, Ubisoft's associate director of marketing for Europe, the Middle East and Africa. The mask technology still belongs to Buzzman, which says it can imagine other, more fragrant uses for its creation. Mr. Mohammed-Chérif envisions a travel company pairing it with visual VR and using it to send people on a virtual voyage to Bali, complete with the scent of sea breezes.